Share the post "Monster .950 JDJ Cartridge with 3600gr Bullet Dwarfs a .50 BMG"
Let me guess – – the “sporting use” was squirrel hunting? haha…wow, what can ya say! Even at $40 a round you get a lot of bang for the buck. Is there a tight neck version? Ok I`ve seen news of this BIG boy here and elsewhere. So far NO mention of any kind of accuracy. Big is cool but can ya hit anything with it..? 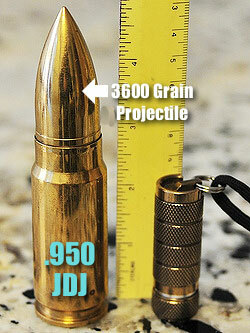 This would be the perfect caliber for Hunter Benchrest. Lol.